Private capital tracker Preqin says in an report, that contrary to expectations, 2018 was another bumper year for the industry, particularly for natural resources investments. Fundraising by unlisted funds for investment in natural resources – oil and gas, timberland, farmland, water and mines – set a fresh record in 2018, totalling $93 billion, and is likely to top $100 billion as more data becomes available. Preqin’s analysis shows energy-focused funds (really only oil and gas as investments in coal have dried up) accounted for almost all of the year’s activity as 77 funds raised $89 billion. The vast majority of these funds target North American oil and gas plays. Capital raised for investment in mining and metals was up significantly compared to last year – outstripping the money raised for farmland and timberland combined, but still makes up only a small percentage of natural resources private capital. Four metals and mining funds closed and raised $2.5 billion with the bulk of the funds destined for North America. Encouraging for the sector is that over half (57%) of natural resources funds exceeded their targets in 2018, “indicating that investor appetite outstripped fundraising capacity,” says Preqin. As of June 2018, the latest data available, natural resources managers hold a record $238 billion in so-called dry powder (funds ready to be invested). Mining and metals fund managers hold $6 billion in dry powder. These funds also hold $16 billion of investments in the sector that still has to be exited. There are 13 funds are in the market currently targeting the mining sector, seeking a combined $4.6 billion capital from so-called limited partners which include sovereign wealth funds, public and private pension funds, foundations, family offices and other entities. 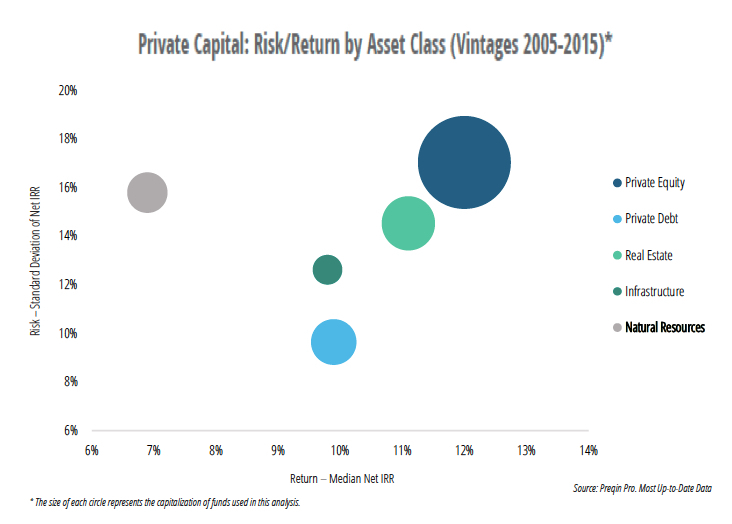 Preqin, which has been tracking global private capital flows since 2003, counts 50 active fund managers focused on metals and mining (compared to 751 focused on oil and gas). If all the firms seeking fresh capital are successful in obtaining capital commitments from investors (unlisted funds that closed last year took on average 17 months to do so), 2019 could equal 2012, which was the peak year for mining fundraising. Some of money secured by the 22 funds in the market classified by Preqin as diversified natural resources funds may also end up being applied for mining and metals projects. Returns from natural resources have averaged just under 7% per annum between 2005 and 2015 compared to 10%–12% for the other asset classes. At the same time Preqin says, the risks entailed in investing in natural resources funds – as measured by the standard deviation between fund returns – place it on a par with real estate and private equity. Of the investors surveyed, 28% are looking to commit more capital to natural resources funds in 2019 than they did in 2018, and over the longer term, 29% intend to increase their allocation to the asset class. As for performance, 77% of investors surveyed believe 2019 performance will be better than or the same as 2018.